The salesman Gustav Adolf Wächtler initially opposed his teenage daughter, Elfriede’s, interest in becoming an artist, and this issue ignited the first of many furious arguments. Elfriede Wächtler nevertheless did enroll in the Dresden School of Applied Arts in 1915, with an initial focus on fashion design, though she soon turned her attention to applied graphics. Her relationship with her father deteriorated considerably during her late teens. Wächtler strove to make her way as a professional artist, working under the pseudynym “Nikolaus” in the belief that a male name would earn her wider recognition. 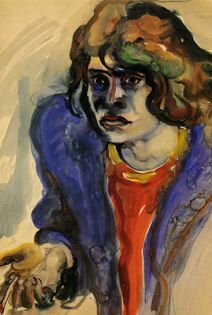 She made connections to such artists as Conrad Felixmüller, Otto Dix, and Otto Griebel—and through this last Wächtler met Kurt Lohse, a singer, actor and sometime art student with whom she would enter into a stormy love affair and enormously troubled marriage. Husband and wife proved unable to adequately support themselves. The pair lived increasingly apart from one another, and Lohse fathered three children with another woman between 1927 and 1930, while still married to Elfriede. Lohse also demonstrated his disregard for his wife’s art by giving his students her finished canvases to paint over. Marital and financial woes brought on a severe nervous breakdown for Lohse-Wächtler in 1929, resulting in two months' hospitalization. Lohse-Wächtler enjoyed her most productive and successful period following her stay in the psychiatric hospital. Then living in Hamburg, she mounted her first major exhibition at the Kunstsalon Maria Kunde in May of 1929. Although she continued to exhibit, Germany’s economic situation worsened following the American stock market crash. The artist is believed to have slept in railroad stations and on the street by the early 1930s; Hamburg’s red-light district served her as both artistic subject and home. Destitute and defeated, Lohse-Wächtler returned to her parents’ home in Dresden in 1931, and her father had her committed to the mental hospital in Arnsdorf in June, 1932. When Germany fell under Hitler’s control in 1933, Lohse-Wächtler, like all mental patients, was considered a non-person; she underwent compulsory sterilization in 1935, and was exterminated in a gas chamber in 1940. The rediscovery of Elfriede Lohse-Wächtler’s at the end of the 20th century prompted numerous German exhibitions and publications devoted to her, and the Galerie St. Etienne mounted the first major American presentation of her work in the fall of 1998. Today, most of Lohse-Wächtler’s artworks are housed in European collections and museums, and they rarely come to market.